For those in the UK, the digital-only BBC4 will be airing an hour of Radiohead’s set from Glastonbury 1997 at 1:15 AM this Sunday night/Monday morning. Wow, we picked the wrong time to go on vacation. In case you didn’t hear last week, Ed O’Brien announced during an interview with BBC 6 Music that Radiohead are “a matter of weeks” away from completing their next studio release. He told 6 Music’s Adam Buxton that the Oxford five-piece changed their working methods on the new material, to avoid the lengthy recording process involved in recent albums such as In Rainbows. To listen to the interview, go here. The pair played a mix of Yorke’s solo material and Radiohead favourites, including ‘Harrowdown Hill,’ ‘Weird Fishes/Arpeggi,’ ‘Idioteque’ and ‘Street Spirit (Fade Out).’ Their rendition of ‘Karma Police’ naturally prompted a mass crowd singalong. The lucky few who had witnessed this most special of impromptu sundown shows Tweeted rapturously about the experience afterwards. It was fitting that Radiohead, a band whose 1997 headline slot is widely considered one of the all-time classic Glastonbury performances, should show up to make sure the festival’s 40th anniversary year was one to remember. What’s that? You want some video? Greg Clarkson at your service! Here’s ‘Weird Fishes/Arpeggi’ shot from the 2nd row. Check out his YouTube Channel later as he says he’ll upload more. 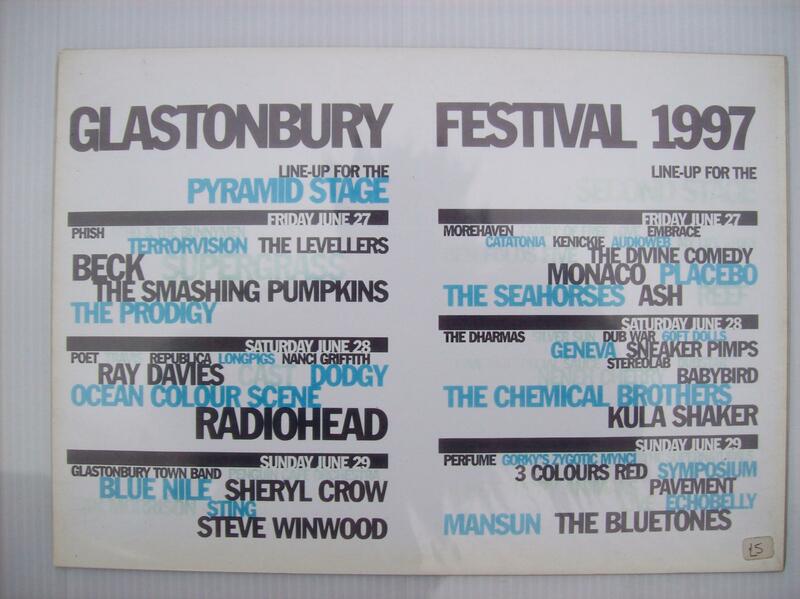 Spotted on our message board, Mortigi Tempo: Full Radiohead performance at Glastonbury 1997. It was filmed from the crowd, so not the best visual quality but the audio is top notch, especially considering this is from a VHS to DVD transfer. Enjoy! 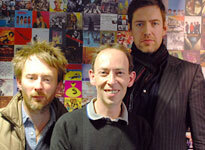 If you missed Ed and Thom on Steve Lamacq’s BBC 6 Music program, don’t worry! You can listen to it by clicking this link. You’ll need RealPlayer, though. – Thom and Ed talk about how they recorded part of In Rainbows in a dilapidated mansion and slept in caravans on the grounds. Nigel wanted to throw the band “in an uncomfortable” situation. “Bodysnatchers” was recorded in a live take there. 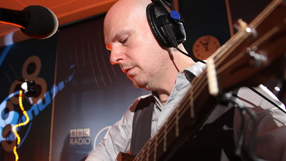 – Nigel limited the band to about 15 or 16 songs to focus on to record. 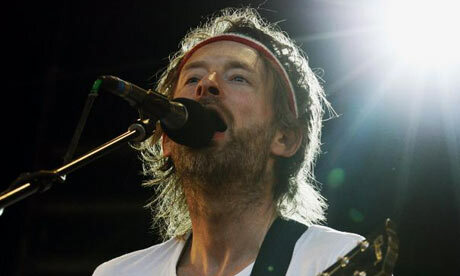 – “Down is the New Up” is described as “mental” by Thom. “Wait till you hear it.” He really wanted it to be on the album but according to Ed, it didn’t fit. – Thom talked about all the “mad theories on the net”, specifically about the theory of 10s. – If they could relive one Radiohead moment again, both Thom and Ed would relive Glastonbury 1997 where the lights and PAs blew up. – Though not finalized or confirmed, they may be playing the US for a couple of weeks starting in May. Europe would follow in June/July. Again, nothing is confirmed! Check out this t-shirt designed by Stanley Donwood for the Glastonbury Festival. Details: Khaki coloured regular t-shirt, new for 2007 and designed by artist Stanley Donwood. This t-shirt has been custom and ethically made. Please note that this t-shirt features a back print of this years festival line up. Go to the official Glastonbury Festival website to order. Speaking of Glastonbury, we have heard that Thom was spotted with his girlfriend and two kids camping in the mud amongst all the other fans at the festival.